Set of 20 animal images, 7 floral images and 2 postcard prints. 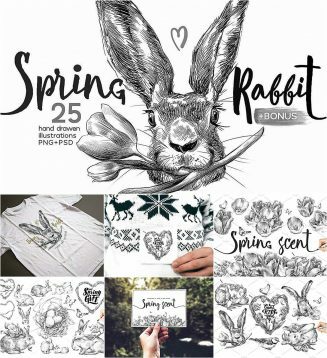 Perfect for Easter theme graphic products – postcards, invitation, packaging, textile prints, merchandise designs and much more. Tags: animal, bunny, Easter, egg, postcard, rabbit, sketch, tulip, wreath.